Pyongyang moves closer to constructing a ballistic missile submarine capable of launching a nuclear payload towards the United States as the most militaristic country rattles its saber once more. North Korea plans to upgrade its ballistic missile capability, as recent photos reveal progress on its dockyards, which will enable Pyongyang to assemble and house larger advanced submarines. The developments come after the country conducted an underwater missile launch earlier this month. A program at the US-Korea Institute at SAIS, 38 North, determined from commercial satellite imagery from the last week that new construction has occurred at the Sinpo South Shipyard on the country’s eastern coast. “The status of work inside the hall remains unclear, but when it is finished North Korea will be able to build and launch new submarines much larger than the existing Gorae-class, including a new class of ballistic missile submarines. Moored alongside the launching way are three small vessels and a barge working to clear underwater obstacles,” the group said in a report. ​The development is troubling as the Hermit Kingdom, as North Korea is sometimes called, appears to be on the march towards acquiring submarine launched nuclear ballistic missiles capable of reaching the US mainland. North Korean officials have already confirmed that they have mastered the technique of warhead miniaturization – making the nuclear payload small enough to be carried by an intercontinental ballistic missile (ICBM). ​The resurgence of North Korea’s saber rattling come at a time when its economy is in ruins facing its worst economic depression in age as the international community, led by the United States, has turned the screws on the country’s leader Kim Jong-Un sensing his regime’s growing vulnerability to domestic opposition. ​Along with South Korea and Japan, the United States has also shown a more hostile temperament towards North Korea provoking the country by flying nuclear equipped B-2 and B-52 bombers over the country and staging a series of aggressive war games that Pyongyang calls a "dress rehearsal" for a full scale invasion. In response, North Korea has continued to violate international agreements on the testing of ballistic missile and nuclear technology with reckless abandon in what security analysts fear may be one last hurrah for the failing regime of Kim Jong-Un. 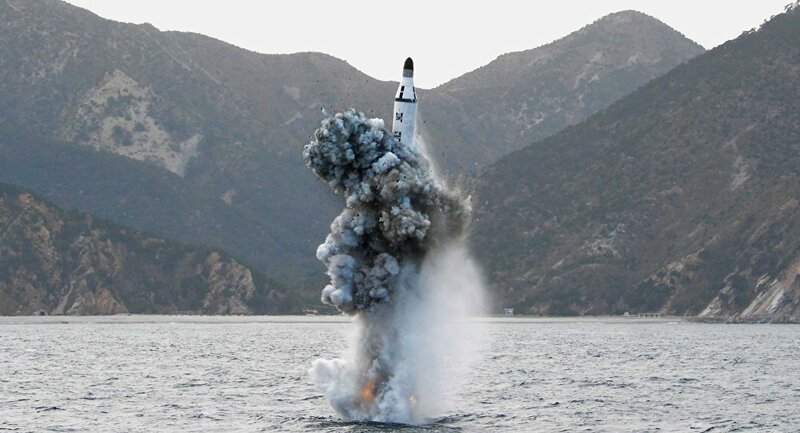 On July 9, Pyongyang violated a UN resolution by conducting a ballistic missile launch from a smaller, less advanced Gorae-class submarine. It was the country’s third such test since December, and while the test failed, the launch proceeded to a further stage than the previous two suggesting that North Korea’s missile capabilities are quickly becoming more sophisticated. Is a Secret Deal Underway for Russia's 1,616MPH Supersonic MIG-29M? While North Korea is also conducting regular testing from land-based sites, "the massive investment North Korea is making into building the new submarine bunker at Sinpo suggests it will be used to protect its most prized naval asset – the ballistic missile submarine capability it is currently creating." The US and South Korea have responded to an increasingly frenetic Pyongyang by finalizing an agreement to extend the Terminal High Altitude Area Defense (THAAD) anti-ballistic missile system to the Korean peninsula. THAAD, which has already been deployed in Guam and Hawaii, would in theory shoot down a ballistic missile as it descends down towards its target.